IBM, Maytag, Unocal…Who’s Next in China’s Sights? Does the aborted bid by CNOOC to acquire Unocal signal the end of Chinese corporate takeover attempts in the West — or just the beginning? On August 2, the company, whose parent is the state-owned China National Offshore Oil Corp., withdrew its $18.5 billion offer for California-based Unocal in the face of stiff U.S. political resistance. The incident prompted bad feelings on both sides, and in the near future, merger and acquisition activity from Chinese firms in the U.S. market may well slow down. But in the long term, analysts say, new efforts to purchase Western companies are likely, given factors that include China’s immense foreign-exchange reserves, Chinese firms’ ability to shore up weaknesses through overseas mergers, and the country’s overall aim to expand its influence abroad. This past weekend, yet another potential deal surfaced. The Sunday Times reported that Chinese network-equipment company Huawei Technologies is in talks to take over British telecom equipment maker Marconi for more than $1 billion. Other possible targets, according to outside observers, include companies with popular brands, firms controlling natural resources and no-name industrial outfits. Furthermore, predicts Wharton management professor Marshall Meyer, smaller Chinese firms, rather than giants like CNOOC, will likely lead the charge outward. CNOOC’s failed bid for Unocal came at the end of a string of recent attempts by Chinese companies to acquire Western companies. In June, China appliance giant Haier tried to buy U.S. counterpart Maytag — a bid it later dropped. Earlier in the year, Chinese computer maker Lenovo purchased the personal computer wing of IBM. Going back farther, Chinese electronics conglomerate TCL merged its television business with the TV business of France-based Thomson, parent of the well-known RCA brand. Reactions to these moves varied. While the TCL and Haier deals drew relatively little attention in the United States, the Lenovo acquisition stirred up questions about U.S. technological leadership. Still, U.S. government officials let the takeover proceed. The CNOOC effort in June to acquire a U.S. company with substantial oil reserves, however, struck a nerve. It came as tensions already were running high between the U.S. and China over trade matters, including claims that China was unfairly keeping its currency undervalued to boost exports. A host of objections were raised to the CNOOC bid — among them the fear that Chinese ownership of Unocal would threaten the U.S. oil supply. According to Meyer’s contacts in the Chinese business community, government officials have advised business leaders to slow down their foreign merger and acquisition activities in the wake of the CNOOC incident. Yet even if China’s “internationalization” thrust does diminish in the near term, Meyer and others see more efforts by Chinese firms to snap up Western companies over the long haul. A foreign merger also brings to Chinese companies certain capabilities they frequently lack, Haley notes, such as service expertise and cutting-edge technology. “Technology is an especially important issue for Chinese companies that view themselves as global competitors. Because customers are so price sensitive, and margins are so razor thin, Chinese companies often lack the resources to make sustained investments” in research and development. Meyer agrees that Chinese companies have a lot to gain from merging with Western firms. For example, the Lenovo-IBM deal is bringing management experience to the Chinese computer maker. Indeed, Meyer’s research into the details of the transaction shows that a consortium of U.S. investors who contributed $350 million to the purchase controls key board committees. Still another factor in the internationalization drive is China’s ambition to restore its prominence in the world order, a position it had centuries ago, Haley says. “China wants to become a ‘civilizational’ power.” The country clearly has the wealth to pursue that goal. “With the possible help of their government and its $700 billion in foreign-exchange reserves, Chinese companies are poised to become bidders for U.S. companies across a variety of sectors,” Laura D’Andrea Tyson, dean of the London Business School, wrote in a recent essay in BusinessWeek. What sorts of Western acquisitions are Chinese firms probably going to make? “It’s likely to be consumer-oriented, brand-name activity,” predicts Christopher Mark, Sr., chairman of The Signal Group, a consulting firm with offices in Princeton, N.J., and Shanghai. Mark suggests that Chinese companies will look to complement their strengths in low-cost production with the distribution networks and brand power that can come with a foreign acquisition. Chinese companies also may seek to buy Western industrial firms that are little-known and private, Meyer adds. One feature of such acquisitions is that they are unlikely to spark much public outrage in the United States. “There will be virtually no opposition to acquisitions of factories making unbranded industrial products,” he suggests. Although the noteworthy buy-out attempts so far by China-based companies have involved relatively large Chinese firms, Meyer thinks future foreign acquisitions may look quite different. “Internationalization will be a small-firm phenomenon,” and the companies that go shopping abroad will be ones in industries that haven’t yet consolidated in China. Why? Meyer says that buying up Western companies can provide key competitive advantages to Chinese firms struggling to survive in hypercompetitive domestic markets. 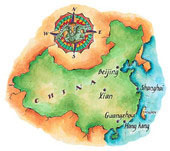 According to Holger Michaelis, a manager in the Boston Consulting Group’s Beijing office, the first wave of outbound M&A happened in the second half of the 1990s, “driven by the objective of the Chinese government to build and strengthen the foundations of the economy and its future development.” It therefore focused on natural resources and infrastructure, such as oil, telecommunications and transportation. “External triggers to this wave included changes in the regulatory environment, the return of Hong Kong to the mainland in 1997 and the Asian crisis,” which resulted in some takeover opportunities in neighboring countries. Even so, Mark questions whether CNOOC could have succeeded in running Unocal. Of the major Chinese oil companies, CNOOC has the strongest leadership, he says but all three firms are weak in that category compared to other Chinese companies. The Chinese oil companies are “quite a bit behind in terms of adopting Western management and financial practices,” he says. Lack of management expertise recalls Meyer’s point about Chinese firms resembling adolescents — a theory that may provide a way to further understand the buzz about China acquiring Wal-Mart. Business leaders in China chafe against the way Wal-Mart controls its suppliers, Meyer says. Thus, buying out Wal-Mart would be a classic act of rebellion. While he doubts it is likely to happen, given the retail icon’s massive $209 billion market capitalization, the actual acquisition attempts so far show a country and business community growing up. “Chinese firms are making their international debut, if awkwardly,” Meyer says. Since China joined the World Trade Organization in 2001, he says, “Chinese companies have been facing growing competition worldwide; that competition is forcing them to speed up the efforts to improve their global reach …. I have talked to a lot of entrepreneurs and they have realized that they cannot compete based only on low costs. They must do research and development and build up their brands. One way to grow is to make acquisitions in foreign markets. Private companies, he adds, “will have a higher success rate because they are more cautious, while state-owned companies tend to be less prepared.” He suggests looking at the overseas acquisitions made by WanXiang Group, a private enterprise based in Hangzhou, whose main business is auto-parts manufacturing and whose assets total around RMB 10 billion ($1.23 billion). It is a company that planned well, negotiated patiently, mapped out very good strategies, and implemented those strategies well, he says. Lu Zhiming, a doctoral student at Shanghai’s Fudan University, gave the following example to illustrate one way that Chinese companies are making overseas acquisitions: Jay Muskovich, CEO of the Huffy Corp., the second largest bicycle maker in the U.S., recently went to China to visit his new shareholder — also his supplier. Earlier, in October 2004, after Huffy had sought bankruptcy protection, it didn’t have money to pay its Chinese supplier. A plan was worked out under which the Chinese supplier and China Export Credit Insurance company would hold a 30% stake in a reorganized Huffy in exchange for forgiving the old debt. The supplier would also have four out of the seven board seats in the reorganized company.